Designing Lace Curtain window coverings can be very confusing. Let's try to simplify the challenge by starting with the very basics. Most major Lace Curtain suppliers offer many different pieces to be used in combinations to arrive at completely different looks. The pieces have various names including One Piece Swags, Fan Swags, Swag Pairs, Valances, Tiers and Panels. They are woven into delicate lace patterns or stunningly bold Macrame ring lace. Depending how you use them, your window treatment can be formal or casual, simple or ornate. Whatever combination you use can greatly influence your over-all design goals. 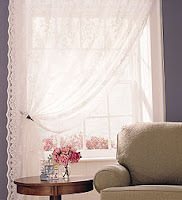 The simplest design would be to use a Lace Valance and a Lace Tier together as shown here. This picture uses a Macrame Ring Lace, however, any Lace Valances and Tiers can be used for the same effect. This design is shown on tension rods inside the window casing. The treatment also can be used where both Valance and Tier are mounted on rods that are attached to the wall outside of the window frame. Another attractive style would be to mount the Valance on an outside mount rod and the Tier on a tension rod inside the jamb. In yet a different version you could mount the Valance on an outside mount rod and use a full length Lace Panel or pair of Panels on a rod under the Valance rod. One of these options may be just what you want but, hold on, we are just getting started. You may want a more formal treatment as shown here. It consists of a Swag Pair with a Valance in between and a full length Panel underneath. As another option, in a narrower window, you could eliminate the in between Valance and just use the Swag Pair or a One Piece Swag. If you use two Panels you could tie them back to each side for a totally different style. Also, a Priscilla look could be created by using a second Panel underneath the first Panel and tying them back to opposite sides. There is another design, shown here, that uses a little of all of the above ideas but is more informal and could be used in a den, dinette or kitchen area. Please notice that this picture also shows one window treatment used over two separate windows which creates the impression of enlarging the spaciousness of your room. As you can see, Lace Curtains can be highly personalized to create the very look that makes your home warm and inviting We are not finished yet. Let's think even more outside of the box. What if you have a curved top window. That's easy. Just find a solid metal rod and bend it to the same contour as your window frame and use the same designs we just discussed. How about another idea. If you have two corner windows you have the option of treating them as one window or two windows. You can mount separate curtains on each window or as in the picture above you can make the two windows look like one giving the effect of a much larger window. Hopefully with this new knowledge you will really enjoy creating your very own professional looking décor by stretching your imagination. The above pictures of window treatments are just a start. You can probably think of many additional attractive ways to arrive at your own person choices of Lace Curtains. In fact, you could even vary the treatments by purchasing lace yardage and sewing your own version of a window treatment. Best of luck with your newly discovered design freedom. Allen Nelson will be happy to answer any and all questions you may have about lace curtain design PLUS you can review even more design tips when you visit his web site http://www.oldeworldelace.com. The author brings to this article 30 years of experience in the interior design field including custom window decorating design, fabrication and installation. His specialties involve all types of window décor as in custom made draperies, ready made lace curtains and macrame ring lace as well as blinds and shades. His designs have been used in a variety of settings in many beautiful homes throughout Southern California.